2 - Euphonium B. C.
2 - Euphonium T. C.
When looking at the line up for the Klavier/Naxos recording in January 2014, I realized there was a need for music of a lighter nature and composed "The Twelve Gallon Hat." The original title was "The Nine and a Half Gallon Hat." 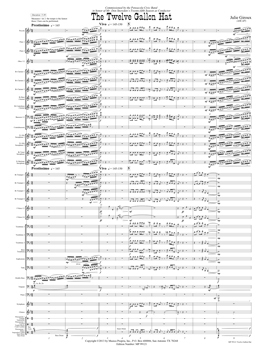 However, following the first reading session, the musicians who sightread the piece all agreed that it was at least 12 gallons in size, so that is the title. Fond of western television and film music like Bonanza, Silverado, City Slickers, The Magnificent Seven and many, many others, I decided to compose a work as a tribute to my favorites. It is a wild ride to be certain, with double tonguing faster than any 6-shooter and woodwind runs flying across the page like tumbleweed. Tie yourself into the saddle and hang on for this fast and furious romp across the wild, wild, wild west!